Late into the second overtime UCF found themselves up two and an alternating possession situation gave them the ball on their own baseline with only 13 seconds to go. Temple was in a position where they needed to foul and UCF wants to get the ball to their best foul shooter safely. Here's how they handled it. Intended shooter "S" just under the weak side elbow. Best passer/decision maker should inbound the ball. Other guard at the strong side elbow. Forward/Centers stacked below the guard at the elbow in a 3 man line. 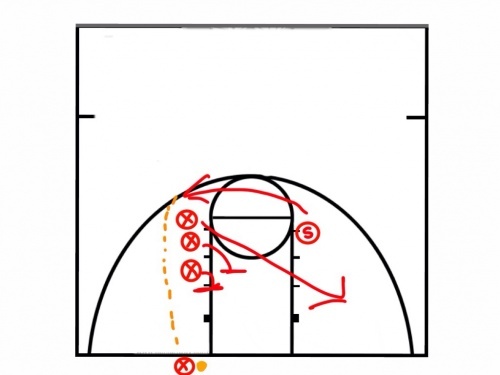 The top man of the stack initiated the play by making a flash across the paint to draw the attention of defenders underneath and on the weak side of the play. The two forward/center players then stepped in a step or two to create a double screen wall. The shooter make a quick jab step to the weak side set up the defender then flashed to the strong side wing which had been cleared out. UCF got the ball in easily to their best foul shooter who knocked down both foul shots to put them up four. Executing this play is so important because Temple hit a transition 3 going the other way but it was a two possession game because of being able to put your team in the best position to maintain control on this play. This page was last modified on 13 March 2014, at 19:06.